This article appeared in the front page of Philippine Daily Inquirer last April 15, 2012. 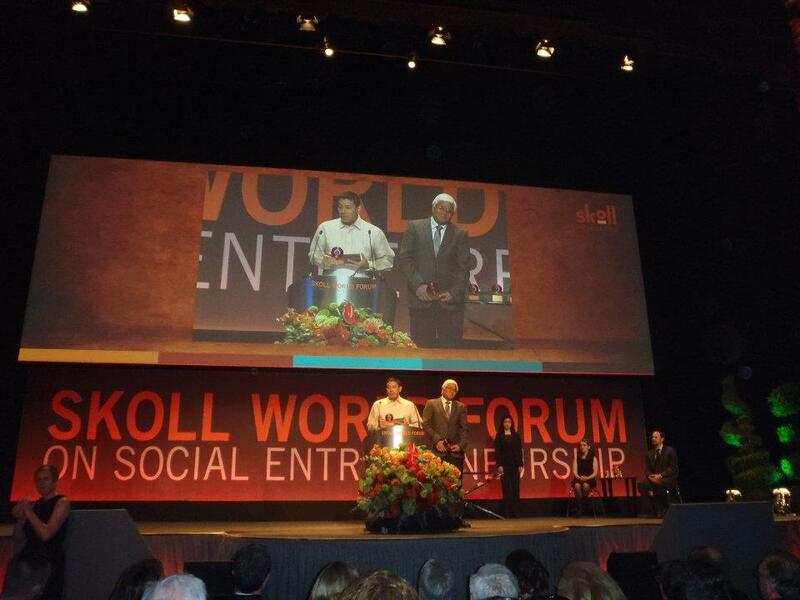 Gawad Kalinga's Front-Page Essay on the Skoll Award by Sally Farhat Kassab of Skoll Foundation here. "I value the freedom to serve more than the power to rule." It was affirming that Skoll Foundation CEO Sally Osberg cited this line from my book "Builder of Dreams" when she introduced me at the global Social Entrepreneur of the Year awarding ceremony at Oxford. The quote became a recurring message, and one of the most tweeted, in the week-long gathering at the Skoll World Forum of nearly a thousand of the world's poverty-busters and freedom fighters who came to share heroic victories after failing and falling many times, and stubbornly, standing up again. To the determined and authentic, service love does not easily give up. Clearly, the desire to serve does more good for the world than the ambition to rule. In the last decade, Skoll Foundation has honoured common men and women who had the freedom of spirit to fly uncommon ideas for the common good, normal people doing the abnormal because the old normal no longer worked. 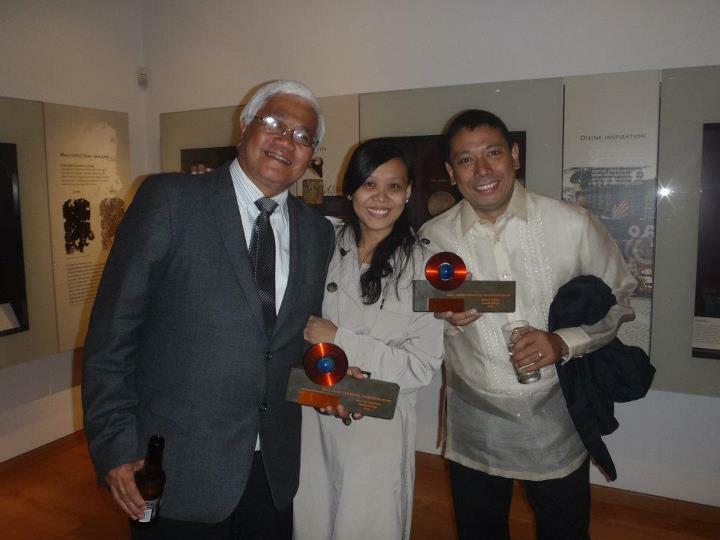 Somebody referred to this global event as a gathering of small people with big deeds exemplified by this year's awardees Landesa, Nidan and Proximity Designs. To be in the company of game-changers and disruptors who are not afraid to turn the world upside down is a big honour for Gawad Kalinga and for the Philippines. EBay Founding President Jeff Skoll said it simply at our lunch meeting on the first day, "just tell your story", how your crazy idea grew wings and flew out of the cage. After the hectic days at Oxford, I'm now trying to piece my story about the incredible journey of ordinary dream-builders from the slums of Manila who have found their way to this world stage. The staggering $1 million prize given to Gawad Kalinga - equal to the Nobel - that came with global credibility and prestige, validated our focus on vision and value and not on money and power. Quite often, it is the cause that chases after money when one begins with a funding mentality. We chose to start our journey to ease human suffering differently by bleeding for the cause, digging into our own pockets and not giving up when the wells dried up and friends started to abandon us. The bright faces of the poor kept us from burning out in the darkest of our nights. Ultimately, big sacrifice bore much fruit - 2000 GK villages built and over a million lives transformed, not only of the most marginalised, but also of the volunteers who found redemption and meaning in caring. When we are not blinded by a desire for money or paralysed by a lack of it, we learn to use our creativity, raise passion-driven caretakers and volunteers whose nobility cannot be bought and the integrity of the mission is not compromised. Like Jeff - who is the producer of socially relevant films The Inconvenient Truth, Contagion and The Help - I am a movie addict, influenced in my causes by unforgettable lines from my favourite films. "Build... and they will come" was a profound message I received from Kevin Kostner in the "Field of Dreams." We did... and they came. We built our first communities without a master-plan and adequate resources and never stopped trying even when we kept making mistakes until we got it right. Others who knew better or had more resources were scared to do it or simply gave up after a few falls. Up to this day, with all the recognition we have received, we are still a work in progress. Big money started to chase our cause with big trust in our everyday heroes who would not leave the poor behind even when their own pockets were empty. The big spirit of our volunteers attracted science and system from universities, corporations and government to come and enhance our delivery, scale and sustainability. Big business became our friend in development as we created shared value for the poor and those helping them. Doing good made good business sense. We had big dreams for small people and we never reached a point when we felt we had enough or had done enough. We continued to persevere - and do so more today - in giving the best to the least for them to help themselves and one another. The floodgates of goodness are now wide open and more social entrepreneurs in the Philippines are leaving their comfort zones to give comfort to the suffering. As we venture out of our safety nets to bring peace to troubled areas, we are turning idle men into productive citizens and making the streets safe for our children. Freedom from want for the poor means freedom from fear for our family. It is to all our caretakers, cohorts, collaborators and comrades in this peaceful revolution for change that awards like this belong to. We have a long way to go to our audacious dream of helping end poverty for 5 million families in our country by 2024 but an important global recognition like the Skoll award brings us closer to our goal. It turns skeptics into optimists, by-standers into doers and deepens the faith of believers that it can be done. The problem of poverty is so massive our response cannot be small. But in solidarity with government, business and civil society - we can lick it. At the formal dinner for present and past awardees in a Harry Potter setting at the university hall, I also dedicated the award to our bold and non-traditional President, Benigno S. Aquino III, for his effort to curb poverty in our country with his relentless fight against corruption and his support for social innovators like GK in restoring the lives of slum-dwellers, marginalised farmers and victims of conflicts and disasters. With his leadership and help from many sectors, we are currently building the homes and communities of 10,000 families who were victims of the earthquake in Negros Oriental and the typhoon in Mindanao that claimed over 2,000 lives. We have found a kindred spirit in the most powerful man in the Philippines whose strength is in making the weak strong, who will not perpetuate himself in office beyond his term in 2016. The trust of social entrepreneurs is a good indicator of a leader's effectiveness and trustworthiness. 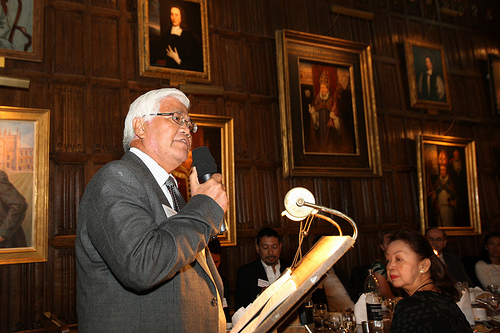 >>> Read Tony Meloto's speech at the formal dinner here. Due to massive institutional reforms from the top by an honest President and many bottom up initiatives by ordinary citizens, all our economic indicators are up, making the Philippines today one of the most stable and attractive investments in Asia. Social enterprises cannot ignore the role of government in development, or take over its role, if they want to make the most impact. They can help in the delivery of services, facilitate partnerships, restore trust and leverage limited government resources with private sector contribution. A challenge that is real for the social entrepreneur is how to resist the temptation of seeking political power when his cause becomes popular. The situation may be different in other countries where a charismatic social innovator becomes the rallying point for political change. It is a hard choice for a game-changer to make as he risks the credibility of his cause and the trust of his supporters when he plays the tricky power game. I made mine simple from the start. By being free of a desire for power, I gained the trust of the powerful to serve the weak. I engaged politicians of all parties but stayed clear from partisan interest, refrained from judging their intentions as long as they were willing to accept our path of integrity to create the greater good. So far none of the over 600 mayors, governors, congressmen and senators we have engaged have tried to corrupt us. Many of them have discovered that doing good to people and the environment is good politics and can help win elections. One great delight for me at the Thursday awarding ceremony was watching Luis Oquinena, my successor as Executive Director, give the acceptance speech straight from the heart. It was a magical moment to witness how a young engineer from my home province of Negros Occidental, who joined me at the beginning of my journey, could speak spontaneously before a global audience of great achievers. His confidence comes from an intelligent heart and strength of character nurtured over the years by hard work and passion for the mission. He has no illusions of grandeur, like many social entrepreneurs, who are constantly humbled by learning from the un-schooled. >>> Read Luis Oquinena's acceptance speech here. It is immensely gratifying for me who started the race to find younger runners with bigger shoes who can take bigger strides towards the finish line, who will use the prize to help the lame walk so they can strive to finish the race themselves. I find it simply liberating to trust the young to shape their future once they're ready and for me to move on to another innovation space. With Luis running our community building effort effectively, my focus now is connecting young entrepreneurs from top business and management schools with farmers in our Centre for Social Innovation(CSI) to build our economic platform for countryside development. We have to combine lofty idealism with enlightened capitalism for the brightest and the best in our country to be wealth creators at home rather than job seekers abroad. That night also belonged to Issa Cuevas-Santos, our Director for Systems and IT, who joined us in Oxford to see the bigger picture and start the networking with other innovators. Still young but wiser at 33, she started with us straight out of college to help set up our network in the countryside, including remote rebel areas. It was her way of confronting her fear since she was 13 when her father, a prominent doctor in his town, was gunned down in front of her by insurgents who were demanding revolutionary taxes from the rich. Restoring the lives of the poor was her way of healing herself since she realised that it was poverty that killed her father. This wounded healer understands that caring is the best prescription for human suffering. Many social entrepreneurs come from the ranks of the wounded. They are in this business because they have known the reality of pain. They gain the freedom to serve by planting hope, not hatred, when their passion for change is fueled by love of neighbour, not anger towards another. Hope heals, hatred creates more wounds. Although she could not be with us being five months pregnant with her fourth child, the Oxford setting made me constantly think of my eldest daughter Anna, who joined me in my work with gang members when she was in her first year at a Jesuit university. She taught me in our early forays in the slum to see the poor as family, not just an object of charity or dole-out. Her epiphany came early after an encounter with a prostitute she befriended in our first camp for outcasts who had been sexually abused by her step-father, gang-raped and had two abortions at sixteen. Seeing Anna in tears at the fate of her young friend, I realised then that my daughter could have been her if she was born under the same circumstances. That day deepened my affection for society's rejects. I started to see orphans and strays as my children deserving of my time, talent and patience. They defined our goal of development: to create a community environment with strong values for our beneficiary families to raise children who will be benefactors to others in need. Society created man-made walls between the haves and the have-nots and made our entire nation poor. It was time to break-down those walls to liberate not only the down-trodden but my descendants as well. The caring DNA must be passed on to my children if I wanted the world to be better than what it is today. It was heartening for me to see at the World Forum the CEO of the Skoll Centre for Social Entrepreneurship Pam Hartigan with her son and daughter-in-law and past awardee from the Philippines Cecilia Flores-Oebanda of Visayan Forum, also with her son, dreaming together as a family of a world without dictators, illegal loggers, human traffickers and hungry children. Power and money used badly are the fathers of plundered nations, raped forests and a suffering humanity. Social entrepreneurs will raise heirs who will no longer see anyone - or any country - as enemy, victim or prey. At Oxford, my wife and I were visited by our British son-in-law Dylan with my two beautiful cappuccinos in tow, Ariel and Chloe. England is also home to my four grandchildren, though their parents have decided to reside in Asia to run a fast growing social enterprise. America is home to two others. Dylan and Anna took a rib off Gawad Kalinga and formed Human Nature three years ago, producing high quality natural personal care products aimed at improving the lives of farmers while protecting the environment through organic farming and creating jobs for GK beneficiaries and many low income families. They are mentoring budding social entrepreneurs, have opened their stores as outlets for their products and support the effort of Gawad Kalinga to build the first Enchanted Farm Village University in Angat, Bulacan - with Pilipinas Shell, Hyundai and GK USA Chairman Tony Olaes with Korean wife Grace - for bottom of the pyramid wealth creation. The GK DNA of caring and sharing is fast multiplying through innovation by off-springs like Human Nature and a growing army of young social entrepreneurs from the big city who have unearthed wealth in the fertile countryside, making fromage cheese from goat's milk, healthy beverages from purple sweet potato and lemongrass and many more. As a social business incubator and a destination for social tourism, this village university has become a popular destination for hundreds of interns from Europe, North America and Asia. It is inspiring to watch our French interns have the time of their life planting bamboo, weaving rattan baskets or building a playground with their adopted local Nanay(mother) and Tatay(father) - former flood victims and demolished squatters. The convergence of rich and poor, white and brown in search of excellence for a better humanity blur old social and racial lines in our village university of hope. I guess this is what the Skoll award means to us: we can all dream of a future where everyone is family and the world is finally free to serve without borders, in the way that new-found brother at Oxford Larry Brilliant has helped make the world smallpox-free. If there is no vaccine to greed, social entrepreneurs will combat the spread of evil by doing more good. With three of this year's four winners from Asia, Hans Rosling was right in his engrossing presentation on demographics that this is the dawning of the Asian age. It is coming at a time when there is much to learn from the good things as well as the mistakes of economies that have advanced ahead of us, to anchor our progress on justice and peace, on capitalism with a conscience - avoiding cut-throat competition, unbridled greed and excessive consumerism - to create profit with a big heart for the least and the lost. Boosted by this award, Proximity Designs will line the road to Burma with springs of living water, Nidan will make the poorest Indian a maharajah in his home and Gawad Kalinga will continue to build heaven in the slums. 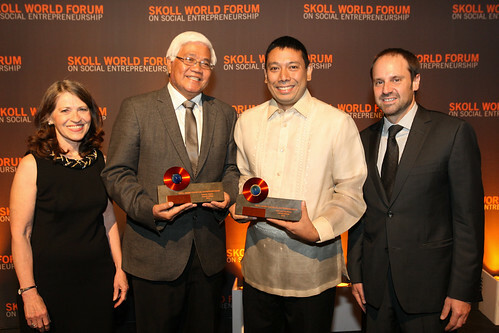 The Philippines will be the breeding ground of social entrepreneurs and the home of the free. To borrow a line from singer Annie Lennox who enthralled us at the award's night - "sweet dreams are made of these."